KDE repeatedly polls as the most popular Linux desktop environment. However, since its numbers are 30-35%, that still means that over two-thirds use another interface. Many, too, rely on GNOME applications, that have an entirely different design philosophy. As a result, for many, KDE might as well be an entirely different operating system. Without some sense of what to expect, users of environments like GNOME or Cinnamon can easily be overcome by a sense of difference and retreat from trying KDE before they have explored everything it offers. The first thing newcomers should note about KDE is that its design philosophy is almost completely the opposite of GNOME applications. As I have explored elsewhere, while GNOME aims for an uncluttered design with the minimum of features, KDE tries to include every possible feature, relying on intelligent defaults to reduce the confusion. Examples of this tendency include Amarok, digiKam, K3B, and Krita. 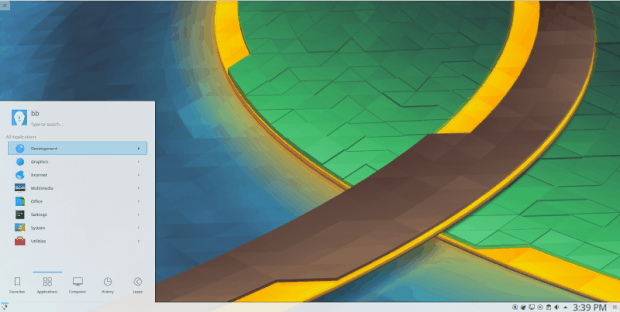 In fact, although interface design has become more important for KDE in the last few years, especially in the Plasma 5 desktop release series, KDE has a traditional tendency to add features first and gradually improve their layout over the next few releases. For example, the System Settings window underwent numerous design changes in Plasma 4 releases, with features being frequently renamed, repositioned, or shuffled to a grab bag Advanced tab until organized better. One consequence of this design emphasis is that KDE is not particularly aimed at beginners, the way that GNOME applications are. While users of GNOME apps have few choices to distract them, KDE users have to cultivate ignoring advanced features until they have need or want to explore them. Some may see this consequence as a drawback. However, since KDE does offer as a foundation a classical desktop, much like MATE or LXDE, with a workspace, menu, and panel, the difficulties can be easy to exaggerate, especially after three decades of graphical computing. Moreover, not everyone wants to work at a beginner’s level. KDE leaves features for more experienced users to discover — features that are often useful for troubleshooting where minimalist applications are useless. Even more importantly, KDE’s outlook means that it does not enforce a single way of working. When the GNOME 3 release series began, it enforced a rigid way of working, with applications started from one screen, and used on another. Icons were removed from the panel, and launchers from the desktop — all in the name of reducing a clutter that designers thought would distract users. It was only after users complained that GNOME reluctantly included extensions that gave more flexibility. By contrast, KDE offers tools that can either change the way you interact with your desktop environment, or else ignore them completely. This approach makes KDE by far the most customizable desktop available for Linux. You can put as many or as few widgets on the desktop or on the panel as you choose, and add launchers to the desktop for apps, files or URL or rely on the menu and file manager, depending entirely on your preferences. Similarly, while GNOME manages virtual workspaces for you, KDE leaves you to decide whether and how to use them. Even details of how and where windows open in the workspace can be customized (or not). If anything, KDE is almost too careful to avoid enforcing a particular workflow, leaving users to find their own ways to use the features provided. Many KDE users are content to stay with the classic desktop. Nor is there anything wrong with doing so if it meets your needs. However, KDE can best be described as a classic desktop with extensions. These extensions help to keep the classic desktop efficient in an era when they are working with dozens — even hundreds — more applications and gigabytes of storage than they were designed for. Under the circumstances, exploring these features can be well-worth the effort. Activities are multiple desktops, each of which can be customized for a specific task or project. While you may want to keep a general desktop, Activities allow you to work with fewer distractions, with all the necessary resources a single click away. A sort of mini-file manager for directories that a task or project often refers to. For example, I have one on my Writing Activity for the folder that contains invoices and my spreadsheet of sales for the year, so that I can update everything as soon as I finish writing. As a result, I get invoices out more quickly than on another desktop. Programmers may not care about fonts, but if you are a designer, KDE is the only desktop environment (so far as I know) that installs with its own font manager. And it’s a solid one, too. Despite a section labeled Candy, these are not just eye-candy, although many fall into this category. They also include useful tools, like a screen magnifier for the visually impaired and a zoom-out grid that shows all open desktops on a single screen. KDE supports up to eight hot spots along the edges of the screen. These hot spots can be used for tasks like screen-locking, and displaying the zoom-out grid. Although using eight is probably overkill, most users can probably think of at least a couple of uses. Call them widgets, applets, or desklets — on any desktop, having a few small apps on the workspace or applet is a popular way to customize. KDE’s include the traditional hardware monitors, toys, utilities, and literal widgets (including one for switching Activities). Unfortunately, along with its pleasant surprises, KDE also includes some unpleasant surprises. Currently, Akonadi, its personal information manager, is obscure and complex, making it almost impossible to troubleshoot Perhaps that is one reason that KMail, which has the features to be one of the hightlights of the desktop environment, often has trouble filtering email, or even accurately counting the number of unread emails in a folder. At times, these features in KMail fail to work at all, so, all in all, you are better off with another email reader. The same unreliability is found in KWallet, KDE’s built-in password manager, which seems to fail erratically, making a security feature more of a nuisance. However, if you avoid these features, KDE repays the effort to understand it many times over. If it’s not the same as other desktop environments, aside from the few exceptions mentioned, that’s a good thing. Get to know KDE, and you may find yourself feeling handicapped in GNOME or Cinnamon. June 1, 2017 in Free Culture. I have been a Linux user since before Ubuntu 9.04, and when the Space Cadet drove Ubuntu off the rails with 9.10, I’ve been a regular user of Mint, with occasional temporary forays elsewhere, including KDE-Mint, -Ubuntu, and -Knoppix. I have also been “into” computing since the minicomputer days, so I’m no stranger to ‘user interfaces’. Based on essays such as yours (this), I’ve tried to like KDE; I’ve really tried, to the point of wondering if the fault were not mine. There’s just something about KDE which I can NOT get beyond. Based on what you’ve now written, I believe you have answered the question for me; I am sincerely grateful for that. a) I am no beginner. b) I do not have the time. A very good, solid, objective, and well-written article. Thank you.